Following any severe storm with high winds, hail or both, the first concern is if there was any damage to the home, especially the roof. Even if there aren’t any visible leaks or issues, there still could be damage. If that damage is left unrepaired, it could result in bigger, more expensive problems down the road. It is important to call in a roofing expert for a thorough roof inspection after a storm. When you choose Broadway Roofing after experiencing storm damage to your home, we will send out a professional to perform our proven 17-point roofing inspection to determine your roof’s storm damages. Broadway Roofing will inspect every aspect of your roof and provide you with an estimate for repairs if there is any damage. 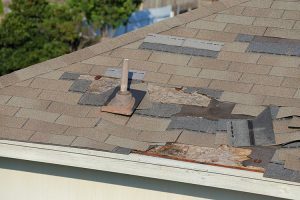 Asphalt and composition Shingles will show hail damage with random damage, meaning that there is no discernible patter. The hail hits will show as black in color. There will be loss of granules from the shingle, this may or may not expose the roofing felt. Asphalt or the mat may appear shiny. Some hail hits could be soft to the touch, like bruised fruit. Wood Shingles also will have random damage, without pattern. A wood shingle could split, causing sharp corners or edges. There will be impact marks along the splits. Tile roofs provide better protection from hail. The tile is tougher and an asphalt underlayment provides another layer of protection. Evidence of hail damage on a tile roof is cracking and chipping that goes all of the way through the tile. It usually takes hail of 2” in diameter or more to cause problems with a tile roof. Corners and the perimeter of the roof are most susceptible to wind damage. According to the National Roofing Contractors Association, most wind damage to a roof starts on the edge. The wind gets below it and pushes it up. Each time it gets below it and pushes it up, it gives the wind more to grab onto, growing and growing with each burst of strong wind. This type of damage can start small and continue to grow during one storm or over time with each occurrence of strong winds. Once the roof is compromised, water can get in causing damage and leaks. Another danger during high winds is flying debris and tree branches. Glass, garbage can lids, tree branches, etc…can cause significant damage to roofs. Sometimes the debris is more damaging than the actual wind. If you have roof damage, if possible, try to find the item that caused the damage. Tree branches can cause scratches and gouges in the roofing materials. Falling branches can even puncture roofing materials. After a strong storm with wind and/or hail, performing an outdoor visual inspection of your home is recommended. Look for missing or damaged roofing materials including shingles, tiles, roofing felt, etc. If you notice just one or two areas of concern, repairs may be needed. If more than 30% of the roof is damaged, a total roof replacement may be necessary. Remember that other roof structures like the chimney, vents and skylights are part of the roof structure and may also be damaged. Damage to anything near chimney, skylights, etc. Perform an indoor inspection. Check for moisture marks of gray, yellow or brown. Look for peeling or bubbling paint on ceilings and walls. Check the attic for moisture, damp rafters, leaks or moist insulation. Watch your energy costs. If energy usage seems to increase and become more expensive, there could be damages to the roof causing air to escape the home through the roof. Contact Broadway Roofing for you’ve experienced possible roof damage after a storm. One of our roofing experts will conduct a roof inspection and provide you with estimate for the repairs.